The Lodge at Carolina in the Pines is a unique 8000-square-foot, luxury, mountain home offered by Mountain Clover Homes that is minutes from five major ski areas, but is the ultimate spot for summer activities. It is one of the many large homes offered by Mountain Clover Homes. This lodge can be rented as the perfect private home for weddings, family reunions, corporate retreats, or the ultimate group vacation ~ the house was originally used as an upscale bed and breakfast so everything is beautifully maintained and all of the rooms are self contained allowing for privacy even when traveling with a large group. The Lodge is walking distance from breathtaking Lake Dillon and marina along the bike path just outside our front door. There are breathtaking views from ten of the twelve individually decorated bedrooms; each offering a TV, private bath. Great rooms include a home theater with a selection of books, games, and CD/stereo. Hot tub, pool table, poker table, and commercial kitchen. The Lodge was created by a lifelong dream to own and operate an upscale mountain bed and breakfast lodge. It was a wonderful experience. When my two boys were born, it was time to leave my bed and breakfast dreams behind and live my dream of being a mom. I opened up the two bedroom owners' quarters and have been able to offer the house with 12 master bedrooms. There are still telltale signs of the lodge's past life....breakfast in bed trays, fabulous beds with high quality linens, beautiful furnishings and spaces for large groups along with private nooks throughout, ensuite baths with each room, and my wonderful commercial-grade kitchen. The boys and I feel so blessed to be able to offer our home to large groups! 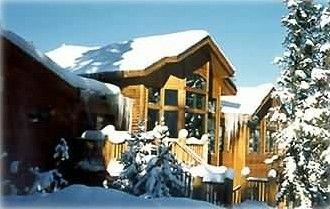 The Lodge at Carolina in the Pines is a 12 BR/12.5 Bath Colorado Mountain Ski and Summer Vacation Rental located minutes from five major ski areas. Perfect for family reunions, corporate retreats, group vacations, and small mountain weddings. We really enjoyed the place. Clean, great location relative to Breck, Keystone, A-Basin. Really liked the Southwestern theme of the home. Thank you so much! We were delighted to have you and we're glad that you got to enjoy the Blizzard of 2019 from the inside looking out! We had such a great time. Our flight was early and Amy and Carol had no issues letting us in early. The house is decked out with tons of amenities, spices, pots and pans, shampoo and conditioner in the bathrooms. Extra towels. It was the perfect spot for our gathering of families. Magical week for me celebrating my 80th with all my family in the most perfect house!. The house was so great having 21 adults & 6 great great grandkids. Everyone had their space and it never seemed crowded. the kitchen was perfect, all the necessary items for cooking as we did not go out with 6 kids. The pool room & hot tub were a big hit with the grandchildren in their 20's.Loved that everyone had their own bedroom & bath. the cable company did get there in the middle of the week & fixed all the TV's in the bedrooms where the TV was not working, never a problem for us has no one spent much time in their rooms. We had the 2 big TV's in the pool room & living room/dinning area. The house was so close to the grocery store & liquor store which we frequented a lot, they were good to keep the drive & porch cleaned off & check the hot tub water each day. Plenty of paper goods in kitchen & bathrooms, really nice. the house made my 80th very special & the week was better than I could have imagined< so many wonderful memories were made in your wonderful house. thank you & Amy for always being there when we needed something! Maybe I can do it again for my 85th, here is hoping!!!! We left the house in good shape, there was a rung broken in a chair that was put aside when we arrived. The wine cooler, never worked , Amy said she did not even know there was a wine cooler..
P.S. Cannot remember did I put down a deposit, if so when do I get it back. This was the perfect property for our family of 25. Plenty of room and everyone had their own bath and tvs. Beautiful view from the cabin! The cabin was phenomenal. The kitchen was amazing and all the cooks could get in there and work together. The rest of the cabin had room for everyone to spread out and there was enough table and chairs for everyone to sit for Thanksgiving dinner. Someone even showed up daily to shovel the snow so we could get out. Everyone said that this property was the best we had rented to date and would like to return. We were delighted to have you and are honored that your family chose our home for your Thanksgiving celebration. We look forward to your return!! Every summer we have a large family reunion. This house was one of the best suited place for us. Carol, the owner was a pleasure to talk to every time. The house was fully stocked, large and well decorated house, and accommodated all of us comfortably. She was accommodating and helpful. I loved reading the history behind the house. I would definitely consider renting this house again for a future reunion. Thank you, Julee! We loved having you and I'm so glad that we got to meet you when you arrived. We hope that we'll see you again in the mountains! Rates depend on Time of Year & Length of Stay.